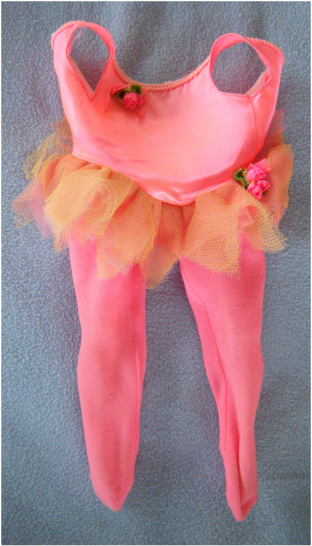 Dancerina is a Mattel ballerina that dances (spins around and toe steps) when the mechanism in her crown is operated. She was released in 1968. There are several YouTube videos that demonstrate her movements. 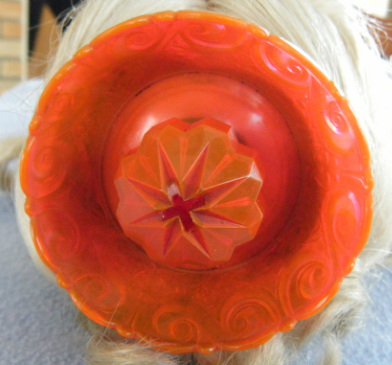 Dancerella, another Mattel doll, came out later (1969) and has a similar dancing mechanism. 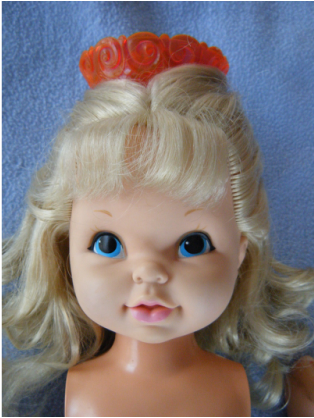 A Baby Dancerina was released in 1972. The problem with this doll is that the ball joints in the shoulder are weak. Both arms broke off. 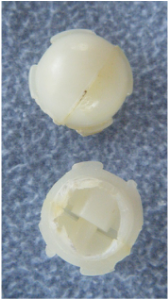 Cyanoacrylate was used to reattach the broken pivots and then the arms were reattached. 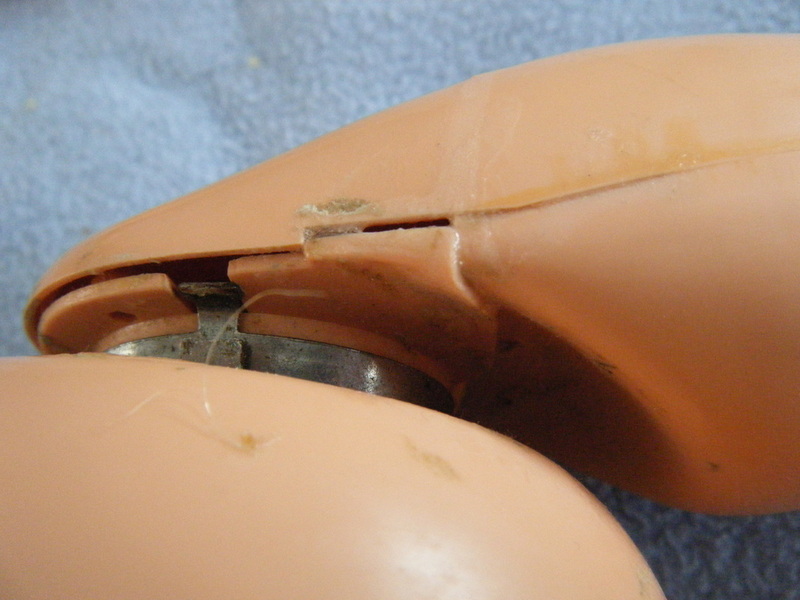 The battery compartment was stained and the contacts showed signs of corrosion from batteries that leaked from being left in the doll for an extended period of time. The fracture on the leg could be due to bending the leg in ways it wasn't meant to move or the natural shrinkage of hard plastic as it ages. 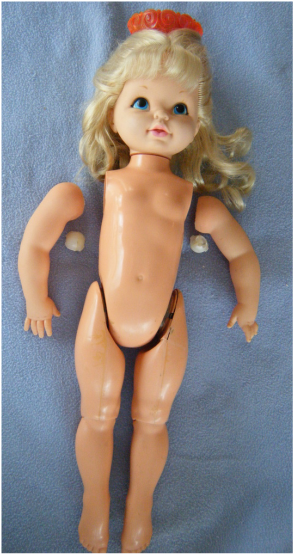 This doll is suffering from broken shoulder joints. The doll's crown is the secret to her twirling action. An original outfit but missing the shoes. A peek inside the battery compartment reveals that a pair of batteries were left inside the doll. In this case, the contacts can be cleaned by burnishing them with a piece of emery paper. The discoloration due to corroding batteries is often permanent. The shoulder joint on this doll is not very robust. The vinyl arm has a flange that pops over a ball joint molded into the internal mechanism. When the arm is rotated the thin walled, hollow neck of the ball joint becomes stressed. Eventually is just twists off, leaving the hole seen in the center of this image. Close-up of the ball joints. A tight fit between the vinyl arm and the plastic ball joint causes the plastic to twist, weaken, and break rather than act as a smooth pivot. The joint would not hold up well to trying to move the arms in a "jumping jack" motion that ballet dancers use. The ball joint came off with the arm and had to be pulled out of the shoulder before being reattached with cyanoacrylate. The arm was then reattached by popping the flange over the ball joint. The same problem is likely to occur again. The only solution is to reduce the friction between the ball joint and the arm - either by reshaping the joint, or using a lubricant. Lubricants might react with the plastic ball joint or the vinyl arm and should be researched before being applied.